No Matter The Issue, If You Think It Is A Plumbing Emergency Then So Do We. Every plumbing issue can be inconvenient, but when you have a plumbing emergency, inconvenience is brought to a whole new level. Not only are these problems unexpected, but if they are not repaired immediately they can end up causing costly property damage to residential and commercial buildings. Some local plumbing companies offer emergency plumbing services because of this reason. When emergency plumbing problems arrive, it is best to work with a 24 hour plumber so that you can assure you will have an emergency plumber readily available to protect your home and business from further damage. Are you in need of an affordable, 24 hour plumber in Southern California? If so, look no further than Complete Plumbing and Rooter. With our 24/7 emergency plumbing service, our 24 hour plumbers are always available to quickly respond to your plumbing emergency and fix the problem at stake. Our years of professional experience and friendly service has made us one of the best plumbing companies in Southern California. We offer our emergency plumbing services in San Bernardino, Los Angeles, Orange County, and the surrounding areas. 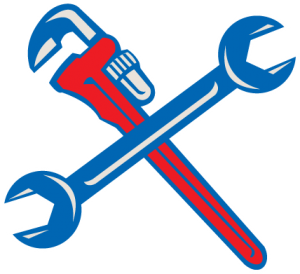 Our team of experienced plumbers are committed to providing the best plumbing service in Southern California. When you have a plumbing problem or emergency, you can rely on Complete Plumbing and Rooter to quickly respond and begin making the necessary repairs to stop any further damage from happening. Burst pipes in a water system are perhaps one of the most common plumbing problems in residential and commercial buildings. 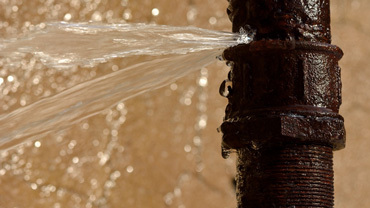 When pipes burst, property damage is almost certain. 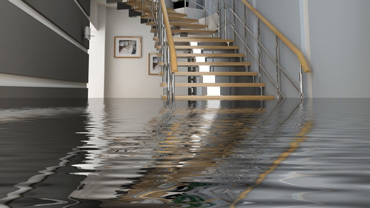 Water from the pipe can quickly flood a room and cause significant water damage to the flooring, walls, and furniture and will require a remediation company. In addition, a single pipe burst could potentially cause a home or business to be without water for days. What Causes Burst Pipes To Happen? In residential and commercial properties that have a pipe burst, the unfortunate event is usually caused by freezing temperatures, irregular water pressure, and unprotected or old piping. And, no matter whatever the cause of a pipe burst is, the consequences and results are usually costly and overwhelming. Water Pressure – One of the most common causes of pipes bursting is water pressure. When pipes clog, the water pressure will continuously increase until the pipes are no longer able to have it — this, of course, causes the pipe to burst. Eventually, pipes will burst if home and business owners do not schedule routine maintenance with an experienced plumbing company in San Bernardino County. Risen water pressure can cause pipes to burst when you least expect it, be sure you have a reliable 24 hour plumber you can call day or night. Freezing – Although frozen pipes might not be a common problem that requires emergency plumbing in Southern California, they are a common cause in homes and businesses that are in for cold climates. If piping in a residential or commercial building is exposed to freezing temperatures, the water inside will eventually freeze and cause the pipes to expand. This will increase the water pressure inside, too eventually causing the pipe to burst. And, since the piping is located within the flooring, walls, and roof spaces, a frozen pipe could lead to water damage and potentially affecting the structural integrity of a home or business’s foundation. It is important to keep water running through property plumbing during cold and freezing conditions to prevent frozen water and increased water pressure. Old or Rusty Pipes – If a home or business is older, there’s a good chance that the plumbing is either weak or rusty and corroded. Rusty pipes can result in multiple problems as it can cause them to become weak and inefficient. Over time, weak pipes will burst and cause a major inconvenience. The best way to stop rusty pipes from bursting is by having routine plumbing inspections. When rusty pipes burst, you won’t have time to search ‘emergency plumber near me’. Know who to call immediately after you notice the damaged pipe to save time and potentially prevent further damages from happening. Nobody wants to experience sewer backup in their home or business, but they can happen to anyone. Plumbing systems can become clogged and cause sewer backups, when this happens an emergency plumbing service will need to be called. Frequent backups and clogs could be a sign of more than just a clogged pipe, but a potential sewage backup. If homes or businesses experience frequent clogs a professional plumbing company should be called to perform an inspection. What Causes Sewage Back Ups To Happen? There are multiple plumbing issues that can cause a sewage backup. Most commonly sewage backups are caused by a clogged toilet, broken sewer lines, and even tree roots! Whether a sewage backup happens in a home or a business, the damages can be costly. Clogged Toilet – The toilet is likely the most hard-working and frequently used plumbing fixture in a home or business. Sometimes, toilet clogs are not a major issue and can be fixed by using a toilet plunger. More serious clogs can be caused by flushing inappropriate items, like diapers, napkins, and cleaning wipes, down the toilet. However, because toilets have the most direct path to a residential or commercial buildings sewer drain, a clogged or backed up toilet can be a sign that there is a sewer back up somewhere within the home or business’s plumbing. A good way to tell if this is an emergency problem is by flushing the toilets and checking to see if water is backed up into the toilet itself, or coming up through the nearby drains. If this does happen, you will need to call a 24 hour plumber to further inspect the potential sewer backup issue. Broken Sewer Lines – If an older home or business in San Bernardino County, a sewage backup could be triggered by busted, cracked, or collapsed sewer lines. With the rise of plastic sewer lines, this possibility isn’t as frequent. However, older homes and business likely have older piping that can be broken down. Tree Roots – Believe it or not, tree roots are a common cause of sewer backups. Many home and business owners who have sewer lines that are free of nearby trees immediately cross-off this possibility, but roots from other trees — like the neighboring home or business’s trees — can be the issue at hand. Tree roots can grow into pipes and create holes and blockages, or they can wrap around the sewage lines and cause significant damage. Natural gas is one of the safest energy sources available to home and business owners today. We use it to cook meals, dry our laundry, and stay warm during the chilly months. However, homes and businesses with even the smallest leak of natural gas can be harmful to those within the environment. Usually, an emergency plumber isn’t necessarily the one people think of when they have a gas leak, but they can be your safest option during a gas leak or plumbing emergency. Experienced plumbers will know how to safely enter a home or business, turn off the main gas valve, and begin searching for the leak. What Causes Gas Leaks To Happen? Gas leaks come unexpectedly and often at the worst times. As mentioned, these leaks can be harmful to the health of the members within the exposed environment, but they can also cause damage to the underlying pipe system of a residential or commercial property. Gas leaks can lead to numerous unfortunate possibilities, like a fire, explosion, or carbon monoxide poisoning. Gas leaks can be caused by appliances, faulty piping, and poor ventilation. If you notice a sulfuric or rotten egg odor, it is important to immediately turn off any gas valves and evacuate the home or business. You’ll then want to contact an emergency plumbing service. Appliance – Most homes and businesses have appliances that use natural gas or propane to generate heat — like a water heater, stove, or fireplace. These appliances have seals that connect the piping of these gas-using appliances, and over time the seals can wear out and corrode. With worn out and corroded sealing on these connections, the possibility of a gas leak is increased. Faulty Piping – It is easy to forget that there is a system of plumbing lying underneath residential and commercial properties. The pipes within the system can erode with time and become faulty. In some cases — when the pipes are in a bad condition — the pipes can disconnect from excessive wear. Faulty and worn piping is common in older homes and it can allow gas to enter into a home. Poor Ventilation – It is not just natural gas or propane that can leak into different areas of a home or business, it can be carbon dioxide too. The leak of this toxic gas can be due to exhaust fans that malfunction or an area having poor ventilation. While natural gas and propane have an odor, carbon dioxide does not. If exposed to this gas long enough, it can cause harmful effects. Plumbing emergencies are likely to happen to home and business owners at some point in time. If there is ever an emergency within your drains, pipes, and other plumbing fixtures, you will need to act fast. The first step should be calling a Southern California emergency plumber, like Complete Plumbing and Rooter! You may also need to take some action to prevent potential further damages to your home or business’s plumbing. While you’re waiting for a 24 hour plumber to respond, here are some things you can do to potentially prevent further property damage from occurring. If you a burst pipe or are concerned about leaks, it is important to locate and turn off a fixtures water valve in your home or business. This step is important if there is a room beginning to flood or a faucet or pipe is leaking water at a rapid rate. Most plumbing fixtures have a shut-off valve located somewhere nearby, which are usually pretty simple to find. If you have trouble finding the shut-off valve for the fixture that is leaking or malfunctioning you will have to turn off the water to the whole residential or commercial property. Complete Plumbing and Rooter Tip: Having trouble finding the bathroom or kitchen sink water shut off valve? Try checking under the counters. If you need to locate the toilet shut off valve, check to the right of the fixture! Even after turning the main water valve off, there will likely still be water inside your pipes. To avoid the excess water going into your home or business, you can remove it from the pipes by turning on any spigots that are outside of the property. If there is a garden hose or outdoor faucet, turn it on to ensure that the excess water is cleared. If you think there may be a clog or back up during this stage, try to open the drain gently with a plunger. While you wait for the 24-hour plumber to arrive, it doesn’t hurt to try assessing the damage yourself. If it is not apparent, try pinpointing the exact location within the residential or commercial property that is leaking or flooding. When you are faced with a major plumbing emergency, it’s a good idea to turn off the property’s water heater to avoid damaging the unit. Once the main valve is off, turn off the water heater to stop heat from emitting inside of it, which can increase the risk of overheating and combustion! If a plumbing emergency causes water to be all over the floors and walls of your home or business, it is important to try cleaning it up as much as possible. By cleaning affected areas, you are potentially preventing the growth of mold and severe water damage. Put down towels, buckets, and whatever else is available to slow down or prevent leaks and pooling of water. Doing some heavy-duty cleaning can help save yourself from getting overwhelmed later on. Complete Plumbing and Rooter knows how important it is to respond quickly to plumbing emergencies. That’s why our team of 24-hour plumbers are always available and ready to arrive on site quickly to begin the necessary procedures. Once you request our emergency plumbing services, you can rest assured that an experienced plumber will soon be arriving to help. The team at Complete Plumbing and Rooter is committed to being Southern California’s premier plumbing company. Not only can we assist homes and business in SoCal with their common plumbing needs — like fixing faucets, garbage disposal repair, and unclogging drains — we are also available 24 hours a day, seven days a week for all plumbing emergencies. Our team will quickly respond to your problem and quickly fix the plumbing emergency as quickly as possible upon arrival to help keep flooding and water damage to a minimum. While plumbing emergencies are stressful and overwhelming, they can be prevented. Have the plumbing professionals at Complete Plumbing and Rooter perform routine maintenance and inspection to your residential or commercial plumbing to help reduce the risk of a plumbing emergency. To learn more about our emergency plumbing services, as well as our other residential and commercial plumbing services, contact Complete Plumbing and Rooter! ©2019 Complete Plumbing & Rooter. Do not copy. All rights reserved.